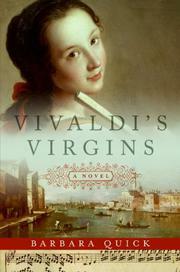 Violin virtuoso in Vivaldi’s all-girl orchestra observes the intrigue of early-18th-century Venice in Quick’s second novel (Northern Edge, 1990). The Ospedale della Pietà is a convent/orphanage/school where the nobility of Venice deposit their illegitimate infants. Particularly talented and fortunate foundlings may become Figlie di coro, musicians or singers with the famed all-female choir of the Pietà. Child prodigy violinist Anna Maria is the latest protégée of Antonio Vivaldi, nicknamed the “Red Priest” for his hair color and fiery temperament. Like many figlie, “Annina” is ignorant about her birth parents, but Sister Laura, her kindly mentor, has instructed her to correspond with an imaginary mother to unburden her heart. Though a Maestro of this august institution, Vivaldi can’t suppress his mischievous streak. He encourages young Annina and her friends to sneak out of the cloister to slide on a frozen canal, attend the opera and crash a masked ball (honoring Vivaldi’s patron King Frederick of Denmark) where the girls witness a keyboard showdown between handsome Scarlatti (who knew he was a hottie?) and the “Dear Saxon,” Handel. At the ball, Annina meets the love of her life, Franz. On a rare school-approved outing to the island of Torcello, Annina helps best friend Marietta keep a date with a lover. When Marietta becomes pregnant, Annina schemes to help her, and in the process causes major problems for herself. Forty-one-year-old Annina relates the events, so her future is known, which diminishes the suspense. Since much of the action takes place during Vivaldi’s enforced sabbatical from the Pietà, he is (regrettably) sketchily rendered. Nonetheless, an intriguing glimpse at the decadence, debauchery and prudery of Baroque-era Venice.